I am 82 and drive a Volvo V50 2.4, which I have owned and driven since 2005. Now that my body is beginning to creak I find it ever more difficult to get in and out of the car, due in part to some mobility problems. I am considering the need for a car with a higher riding position giving me easier access. I would like to ask your opinion as to the type and model that would best suit? My car would have to be an automatic, petrol not diesel, aircon, 4x4, heated front seats, reasonable spec throughout, minimum VED. I have about £20,000 to £25,000.00 to spend, not necessarily brand new. Your input would be very much appreciated. Saturday 22nd October was my shopping day at Lidl. I normally get there at 8.00pm and leave at 8.30pm. However Lidl ticketed me for leaving at 8.27am he next day, after having arrived at 8.00pm the night before. No way I was there for 12 hours, 26 minutes and 37 seconds. It seems that Lidl’s camera didn't record me leaving the previous evening. No way I stayed there overnight. If you don't get a prompt reply and an apology, write again and tell them their parking charge amounts to attempted extortion and illegal harassment the only basis of which is their negligence. My car is a 2011 Renault Grand Scenic 1.5dCi auto. I was advised to change the cambelt as mileage was over 80,000 and the car was more than 5 years old, even though the car was running perfectly. I bought a cambelt kit from EUROCARPARTS and had it fitted. 6 weeks later the belt slipped, lost teeth and caused massive damage to the engine. The camshaft sprocket actually shattered. As it was only 6 weeks, I assumed the warranty would pay the huge bill. Strangely, EUROCARPARTS have said the belt was fitted wrongly and will not honour their warranty. Where do I go from here? As regards the shattered camshaft sprocket, the remains show signs of fatigue. Are they prone to such damage? Could this be the cause of the failure, in which case is Renault at fault? Surely something like that must last longer than 5yrs? them or you have to prove that it was fitted correctly and sue Euro CarParts for a duff belt. It’s never clever to source parts yourself, then have a third party fit them because you then destroy the chain of liability. There have been a few reports of early timing belt failures: /carbycar/renault/scenic-plus-grand-scenic-2009/?section=good/ But because the parts were obtained independently and were also fitted independently I think you'll have difficulty holding Renault liable. Could simply be that the fitter put too much tension on the belt and that shattered the pulley. My Mazda CX5 (FWD 2.2d) has just passed its first MoT at 20,000 miles with an advisory on radial cracking on all 4 Yokohama Geolander 225/65 V tyres. Tread depths remain 2mm front and 6mm rear. The fronts have worn down below the swipe tread pattern, which I understand gives the bulk of the rip in rain (and snow/ice). Is radial cracking not a problem? I am advised just “to keep an eye on it”. So should I just carry on with the rears till they wear down? Your correspondence says such cracking is a form of perishing of the rubber at 3-years old? Are some brands more resistant to this than others. I will replace the fronts even though they are legal, but ask how tyres can be legal if much of the tread pattern is worn away? I'd replace them all. Michelin is now reckoning that its tyres are good right down to the 1.6mm treadwear markers. Other tyremakers are advising a switch at 3mm. Winter's on its way. You want a lot of tread for that. I guess you're on 17s. Unfortunately Michelin does not yet do Cross Climates your size. But you may be able to get Goodyear Vector 4 Seasons Gen II, or another all weather tyre. I am nearly 64 years old. My VW Transporter Type 4 T4 campervan is nearly 18 years old. I know this is a bit early but I want to ask, what groups on my licence, do I lose when I reach 70 years of age. My campervan is only 2,800kg so isn’t a problem but what if I got a bigger one, say over 3500kg, would I have a problem at 70 years old? I passed my test, full driving licence in 1970 and motorbike licence in 1969. I wonder how many people know that they lose a group at 70. Also, I wonder if younger people know that they are restricted on what weight they can drive. This portal give you all the links to the relevant government websites: /faq/driving-licence-entitlements/ You must keep a copy of your old licence groups and must at least make sure you don’t lose the motorcycle entitlement. I would appreciate your opinion on a PCN I received. I appealed because the machine was broken and I had not been able to pay. Today I received a letter from NSL Lewisham saying "I have consulted the Civil Enforcement Officer's electronic notes regarding the above notice and consider that you have not made a case for the cancellation of the Notice". I passed the station today and noted on the meter "If the machine is not working use another machine.” But there is no other machine at this location. It also says on the machine how one can pay by mobile phone, assuming that we all have one or require us to have one. I did not know that I was obliged to have a mobile phone in order to fulfill my obligation for parking. What next: passport, birth certificate? Well then, your appeal has been denied. If this is a private parking prosecution then let it go to small claims and make your very simple, straightforward point to the judge. If it's a street parking 'offence', then one of the Traffic Penalty Tribunals. Don't complain about not having a phone. Your point is that the only machine at which you could physically pay was broken. I have a 2015 Ford Kuga 2.0TDCI 4x4. Over the last 6 months I have become aware of the vehicle "running away with me". It will quite happily maintain a speed of 20mph at 1000rpm without my foot on the accelerator. At times and in certain road situations this can feel dangerous. I have spoken to my local Ford dealer about this. After two visits their Technical Advisor has told me that this is correct. The engine management system has been coded to include this feature as an anti stall device. Is this correct and if so is it a feature on most new cars. There is not a word about it in the Car Manual and other mechanics at the dealership were unaware of it. I look forward to your comments. Of course it will. It's a diesel. The engine will not run below 800rpm so the car moves at whatever speed that corresponds to in the relevant gear. If it's too fast for you, change down. I would like to say many thanks for your prompt reply to my request for an suitable car for me at my age. The Kia Niro seems very good and I intend to source the car. The only thing I am not sure is if this model has automatic dipping headlights? Sorry, that wasn't something on my specs list (which you probably read anyway). I checked the KIA website and found standard Bi-Xenon headlights with automatic headlight control. I think that simply means they go on at dusk, not that they automatically dip. 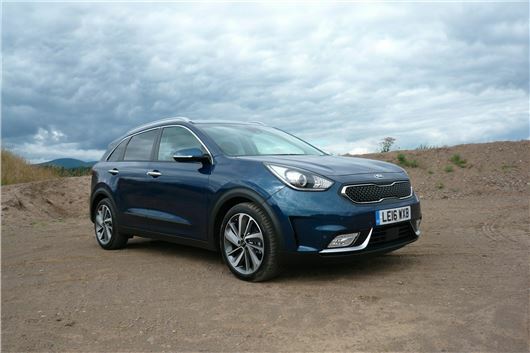 http://www.kia.co.uk/new-cars/range/mid-sized-cars/niro/specification/exterior-features.aspx. I recently purchased an eight month used 4 Series GranCoupe from a BMW dealership. The car has 19” alloy wheels with runflat tyres. There is considerable rust on the brake disc rotor bell (I think that is what it is called). The BMW dealership tells me that this is very common and that they have new cars in the showroom that has that have this issue. I find this explanation quite unsatisfactory and was wondering if there is anything that can be done to resolve and remedy this. That's perfectly normal because ordinary paint will not stay on cast iron alloy wheel hubs. Very few cars come with painted hubs. You could have them painted the colour of your choice with Sperex VHT (Very High Temperature) paint. Some BMW dealers will do it FoC if their customers complain loudly enough. I ordered a new A6 Avant Bi-turbo 2 years ago from Poole Audi with whom I had done regular business for over a decade - slowly refining the spec with every car - and one of my 'must haves' was folding mirrors. The salesman was always reliable and accurate, but on this one occasion, one letter on the order code for the folding mirrors was incorrectly transposed and the car was delivered without the folding mirrors. I had a long conversation with the salesman and the local Audi technicians who were initially of the opinion that they couldn't be changed - but some investigation and a bit of logic by me and they were persuaded that the non-folding mirrors are essentially the same as the folding versions. The interior door handle is essentially the same, but minus the controls. To cut a long story short, some technicians arrived from Audi HQ at Milton Keynes and the mirrors were changed to power folding in a day. They worked perfectly and were an excellent example of a dealer striving for excellence in customer service - they certainly succeeded in my view (although I guess it cost them a fair few quid to achieve this). So to answer the query in the Saturday column, SB should talk to his dealership - they might just pull out the stops again. Well done. That's the difference between a smart customer and a good dealer and a not so smart customer and a lousy dealer. I am thinking of buying an Audi A5 Sportback automatic. My budget is £25k.Is this a wise choice of car? If yes which model variant would you suggest and what faults could I expect? I bought a new BMW X3 in September 2012 from Westerly BMW in Yeovil, Somerset. In August 2015 it went in for a service before the warranty ran out and they found a slight leak from the sump and changed the seal. A couple of weeks after that we started to get a smell, similar to that of Natural Gas, whenever we became stationary after a long run. The garage took the car in and over the next six months tried various means to stop it including changing the automatic gearbox, changing all oils, changing filters and extending various breathing pipes further back. All to no avail and apparently this is the first time BMW have had this fault occur. In March this year they eventually took the car in permanently, giving us a loan car, until they had solved the problem. 5 loan cars later they have still not fixed the fault although it has been localized in that BMW have discovered that the oil in the front diff smells like Natural Gas when hot. However they cannot work out how it gets into the car having done extensive smoke tests amongst other checks. I contacted Which Legal in May and they recommended I write to the garage saying that, “given the fact that you have had ample opportunity to repair the car and the fact that it is still not ‘fit for purpose’, the best way forward would be for you to accept the car back and give us a partial refund to include the current true value of the car (if it did not have this problem) and some compensation for the loss of use of the car over the past nine months”. In reply the garage stated that “the legal advice was incorrect as I had been quoted part of the old (previous) Consumer Credit Act. Also ‘Fit for Purpose’ cannot be applied two years after delivery as the ‘test’ is that the consumer has to prove that the fault was there at the time of delivery. They did offer to part-exchange the car for a new X3 but they would only give me the trade value for the old X3, and give me £3,000 off a new X3 comprising £1,000 from BMW and £2,000 from the garage. However being an ex-serviceman I can get about £5,000 off a new BMW X3 from BMW Park Lane anyway and if the car was fully serviceable I could sell it privately for much more than the trade value offered. The Service Department at Westerly, Yeovil has been excellent and fully understands our predicament and keeps us well informed throughout. However, our problem is that we both have bad backs, and our X3 has special electric comfort seats with lumbar support. Unfortunately it appears that this is a very rare spec and so none of the cars we have been lent have the added lumbar support. Hence, while the cars have been lovely to drive, this is not true from the comfort point of view and we have to take a break much more often when on long journeys, which we do normally at least once a week. We finally thought that we were going to get our car back last week, but on the last of many extensive test drives the smell appeared once again. Apparently, one other X3 has also had a similar problem in Scotland recently, although it appears that extending the front diff breather tube has solved their problem. The garage admits that they have tried everything and are now once again waiting for BMW to suggest further work. The problem has resulted in our having to cancel two driving holidays to Europe and we also have not been able to use the towing capability as none of the loan cars have been fitted with a towbar. My question for you is: can you help and do you have any suggestions on how to bring this very long running saga to a conclusion. This is my standard advice: /faq/consumer-rights/ Basically you have to come to a compromise solution with the supplying dealer, or take the matter to the full County Court (small claims limit £10k, which isn't enough in your case). Court action could cost you a fortune if the dealer fights, so best to try to reach a better solution with the dealer than the one proposed. I think the fluid in the front diff is probably contaminated with floodwater. It’s difficult to believe that changing the fluid in the front diff and extending the breather tube will not solve the problem.